Without any fuss or celebration (unless I just wasn't invited! ), The British Newspaper Archive quietly strode past a significant milestone on Saturday (see blogpost). One day later, with no rest for the wicked, and another new title joined the database's line-up. The Sunday Life is the tabloid sister paper of the Belfast Telegraph. It first appeared in 1988 and is currently owned by Independent News and Media plc. 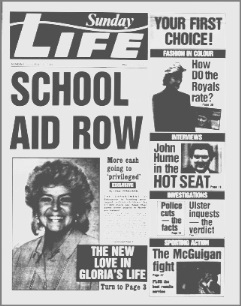 So far, only Sunday Life editions published from 1988 to 1997 are available to search, but the fully digitised holding for this paper will run to 2005. As with all other Irish publications in the online database, this paper is now available to view on the BNA website or, if you have one of the premium subscriptions, via FindMyPast. With this addition, the online BNA holds 44 newspapers from Northern Ireland and 123 from the Republic of Ireland.